You are here: Home » Guest Writers » Looking ahead to Southampton! Posted by: supreetkini on September 15, 2012 in Guest Writers, Match Previews Comments Off on Looking ahead to Southampton! Beautiful Saturday is finally here, and things are really falling into place. I have stopped being a grumpy maniac with self esteem issues, for now atleast, and hopefully will remain so till the next international break. Southampton are the opponents today, and they will be no walk in the park. Managed by Nigel Adkins, they have shown very early on this season that they have the talent to ruffle some feathers of the big teams. Back in the Premier League after 7 years, the South Coast club led Manchester City 2-1 at one point at the Etihad, in the first game of the season, before the champions came away with all 3 points. They led Manchester United twice, before a grumpy Dutchman, with a little boy in him scored a hattrick to steal all 3 points. Though the South Coast of England has never really bought out too many talents to have lit up the English football scene, a certain Matt Le Tissier apart, Southampton have been at the forefront of developing some bright young players over the years. Arsenal have certainly benefited from this, with Theo Walcott being signed in 2005 and Alex Oxlade-Chamberlain last year. Other players who have come through are Gareth Bale, Norwich City’s Andrew Surman and presently have highly rated left-back Luke Shaw in their ranks. Team news, then. Wojciech Szczesny is expected to start, despite the manager recently revealing, that there is an interesting situation being created in the goalkeeping department, with the recent good form of Vito Mannone. While Mannone has been deputizing well, I think it is but common sense to have your first choice keeper back in the team. Defensively, there will be a few selection headaches, now with 3 world class centre-backs at his disposal. The problem is that Thomas Vermaelen and Per Mertesacker have been brilliant in the first 3 games of the season. Mertesacker has shown some steady improvement, and his reading of certain situations in all the 3 games has been at its best. Thomas Vermaelen, on the other hand, has curbed his attacking instincts, specifically after stern instruction from Steve Bould it seems. He has rarely ventured forward, and the problem is dropping your captain is not an option. Laurent Koscielny had his best season last year, and surely will be hoping to be first choice, after his comeback from injury. For this game, however, I feel Mertesacker will start. Koscielny may still need a bit more time to build on his match fitness, and Montpellier midweek would be the perfect ocassion for that. Apart from that, the only injury worry is Abou Diaby. While some reports say he should be fit, I am sure the manager wouldn’t want to risk, knowing the player’s past injury problems. Francis Coquelin or Aaron Ramsey is due a start here, and I feel it will be the latter who gets his chance today. What this will do is provide a very interesting situation in midfield. Arteta has been deployed at defensive midfield, and will be continued to play there. Now, with Aaron Ramsey playing, would it mean that Cazorla may have to slightly drop back, to join Ramsey in dictating play, or will Ramsey fill the same gap left open by Abou Diaby, acting as an effective link between defence and midfield. Should Francis Coquelin be given the nod, it is quite clear that he will be handed defensive midfield duties, with Arteta being asked to play slightly more forward, which is his most preferred position. Theo Walcott picked up an illness during the international break, and will be assessed late on. With the manager having rotated between Gervinho, Chamberlain and Walcott in the opening 3 games, he may still not be sure of whom to play in the wide position. Gervinho could be given a rest, after his long trips to and from Africa, and I expect Chmaberlain to start against his former club on the right wing. 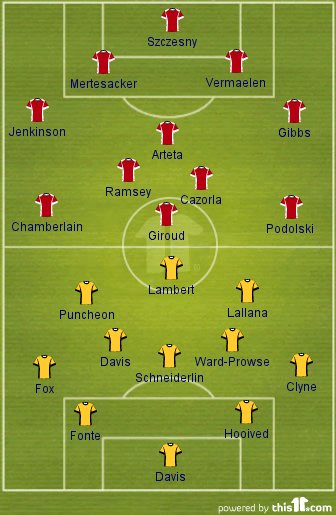 This is how I feel the teams will line up today. Southampton do not have too many names there who have played in the Premiership before, except for midfielder Steve Davis who has played for Aston Villa and Fulham previously. This goes to show, really how well the level of the Championship has risen. What one can expect from the Saints is a real hard working game. Now, having conceded 8 goals in 3 games, they will know that coming to Arsenal and expecting to see the ball only for rare moments in the game, they will have to really tighten up defensively. Morgan Schneiderlin was a real workhorse in the game against Manchester United, and much of the same will be seen again. Striker Rickie Lambert has been a goalscoring machine in the lower divisions, with various clubs, and he has already shown he can cut it out in the top divisions, with 2 goals in 3 games so far. Arsenal should really have to watch out for him. Another man to watch out for is highly rated Uruguay international, Gaston Ramirez, already touted as Southampton’s biggest ever signing, who was snapped up from Bologna for £12 million. He should be on the bench for today’s clash. Enjoy the game wherever you are! Previous: All the Scoop and Some Early Team News!